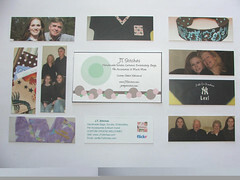 When I upgraded to flickr pro, Moo gave away 10 free mini cards. These cards are the cutest little things! It was so hard to choose which ten pictures I wanted to do & which would look good in that tiny rectangle. They give you 1" X 2.75" (28mmX 70mm) rectangle & you need to slide the picture into place how you want it to look. The only thing I didn't like about that is you can't make the rectangle larger or your picture smaller so you can fit what you want into the rectangle, you can only make the picture larger. I'm sure there are ways around this, there always is. I did half of my items & half of my family. On the other side I added my (now old) advar &my business card information. The business card in the center is just to compare the size of the mini cards. They give you the option to add 6 lines & other things. They have a matt finish & are on *heavy* card-stock. You need to check them out, they are super cute! I can't wait to take more pictures so I can get 100 more. I don't want to give any of my 10 away they're too cute!